The HydroStar Onion Tank (also referred to as a blivet or pumpkin tank) by GEI Works is a dependable, durable, and portable open-top water storage tank which is suitable for use in emergency response. 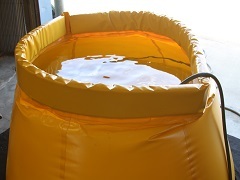 Additionally, onion tanks provide containment for water, or retention of hazardous or sensitive materials. *Depending on your chemicals and liquid storage requirements, we may require customers to provide us with an SDS (Safety Data Sheet) to help confirm compatibility with the chemicals you will be storing in the onion tank. HydroStar Onion Tanks are designed with functionality, storage, and transportation in mind. Similar to other dump tanks, they fold into a compact, easy to move bundle and can be easily and safely deployed by one person when needed. HydroStar Onion Tanks are manufactured with a floating foam collar at the top which maintains the integrity of the tank's shape as it is filled. Fitted into the flexible wall of the tank is a two inch bulkhead valve with a plug that allows for quick draining of the onion tank, or for hooking up an additional filling location. As a result of the tank's design, it will self-rise and self-support as liquid fills the interior. 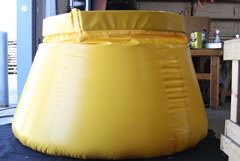 The tank material is commonly made from vinyl, urethane or NSF 61 approved materials. Additionally, the fabric used is crafted with extended durability, UV resistance, and outdoor conditions in mind. Not all fabrics are suitable for all uses. Please let us know how you plan to use your onion tank so we can make sure it's constructed with the right fabric and coating for your specific needs. 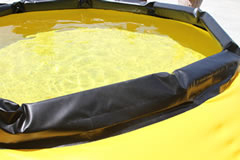 Please contact us to discuss any questions about onion tank lining or your requirements. Need an onion tank? Call 772-646-0597 or request a quote. For more information, please visit our Hydrostar Onion Tank Overview or our Hydrostar Onion Tank Emergency Response page. Questions? Call our team at: 772-646-0597.